Premium white goose down creates a dreamy fluff you can sink your head into night after night. This low-loft pillow is perfect for stomach sleepers and those wanting the softest pillow we offer. Traditional design adjusts as you reposition throughout the night. I ordered 2 of the hotel type pillows and they are WONDERFUL!!! Look forward to going to bed just to use them!! 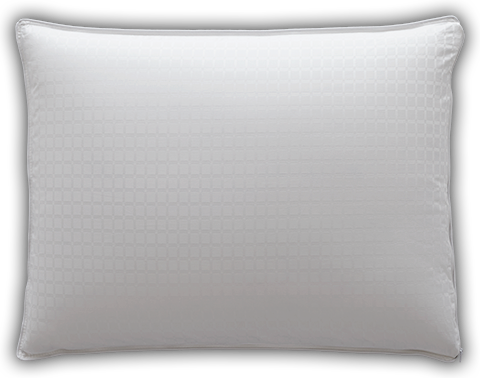 This 600-fill power Hyperclean® white goose down pillow is crafted with a 230-thread count, 100% cotton cover and edged in white cording. For your convenience, a 305-thread count, 100% cotton zip cover is included to protect your pillow, keeping it cleaner, longer. Both the pillow and cover can be machine washed and dried. Our traditional edge pillow is made by sewing the top and bottom pillow fabric together. This results in a single seam around the perimeter of the pillow giving it a tapered look. White goose down is the soft insulating material found on the breast of a goose. Unlike feathers that have a quill, down has no hard elements. Considered one of Mother Nature's best insulators, a down cluster is a light and fluffy three dimensional spherical puff with multiple filaments that expand to trap air - giving white goose down bedding its signature loft and cozy, embracing warmth. When used in pillows, down provides soft adjustable comfort that conforms to your changing sleep positions. Pacific Coast® white goose down is carefully sorted and selected to ensure that only the fluffiest clusters are used.